Leader of Iran’s Islamic Revolution Ayatollah Seyyed Ali Khamenei has thanked police forces for their efforts to improve their behaviour towards the people, saying such efforts are useful in winning people’s trust. 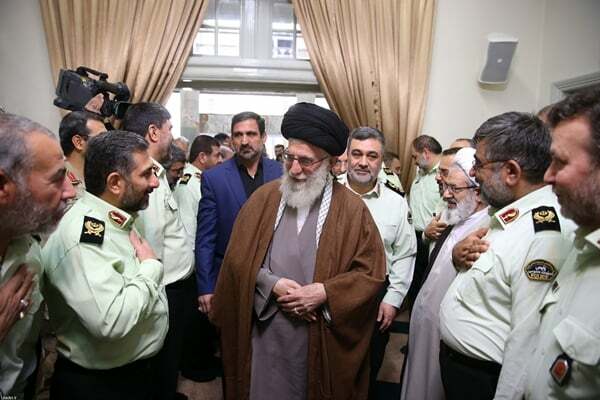 Speaking in a Sunday meeting with commanders of Iran’s police in Tehran, Ayatollah Khamenei said the behaviour of police forces is under the public scrutiny, and people tend to generalize their impression of the police’s performance to other parts of the Islamic Establishment. “You should act in a way that the people find the police a powerful, fair and vigilant force,” he said. Police forces have made significant progress in improving their behaviour towards people, but they need to improve further, he said, calling for “non-stop progress” so they reach a level that deserves the Islamic system. “The performance of the police forces must be wise and thoughtful, in a way that it helps the police win people’s trust,” he said.